Summary: This 2007 report by the Carnegie Foundation and the Center for Applied Linguistics identifies challenges faced by adolescent ELs in meeting grade-level academic expectations. It also provides recommendations for teacher education, educational research, school administrators and policy makers, along with instructional approaches likely to increase student achievement. The downloadable PDF would be an excellent resource for teacher leaders designing professional development programs, developing grant proposals, doing advocacy work, and developing knowledge about teaching middle/high school ELLs. 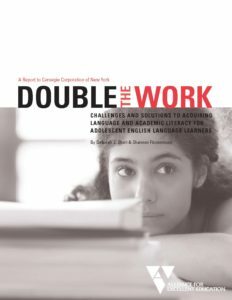 Double the Work (PDF), co-funded by the Carnegie Foundation and the Center for Applied Linguistics, outlines the challenges that secondary English language learners (ELLs) face in trying to meet grade-level academic expectations while they are still acquiring the English language. This report is crucial reading for all individuals who work with secondary ELLs, whether as classroom teachers, support teachers, or administrators. Set common criteria for identifying these learners and tracking their performance. Develop new and improved assessments of their native language abilities, English language development, and content-knowledge learning. Build capacity among pre-service and current educators to instruct these learners effectively. Design appropriate and flexible secondary school programs that offer time and coursework that account for the second language development process. Use research-based instructional practices more widely and consistently. Fund and conduct more short- and long-term research on new and existing interventions and programs, and on the academic performance of these adolescent ELLs. Copyright 2007 Carnegie Corporation of New York. Short, Deborah J., and Shannon Fitzsimmons. 2007. Double the Work: Challenges and Solutions to Acquiring Language and Academic Literacy for Adolescent English Language Learners. A report commissioned by the Carnegie Corporation of New York. Washington, DC: Alliance for Excellent Education.